You're in high school and you're thinking about getting a part-time job. Maybe you wish you had some extra cash to buy new clothes or school supplies. Or you may want to gain a little independence from your parents. (Don't you hate having to ask your parents for money every time you want to go get pizza with your friends?) For some, graduation is right around the corner and you’d like to get some money in the bank for your future. Whatever the case may be, you need cash, and you’re thinking about getting a part-time job for the school year. Working during the school year is a great option for many high schoolers. This is especially true if you are trying to gain experience, earn money, and develop new skills. But let’s face it, the average teen has a lot more on their plate than school, alone. We’re talking sports, clubs, youth groups, theater, music lessons, family obligations. And let's not forget about hanging out with friends. Many teens become overwhelmed when they think about adding a job into their jam-packed schedules. If you’re wondering how to balance work with the rest of your busy life, then you’ve come to the right place. The first step is finding the time to work. One way to do this is to use a weekly planner. First list every one of your obligations -- school, homework, sports, clubs, and so on. In this list, be sure to include things that help you unwind or relax, such as spending time with friends, playing video games, or sleeping. Next, put your obligations into your planner on the days and times they occur. Notice the free time you still have in your day. If you've got at least 10-20 hours of free time every week, you have enough time to get a part-time job. You still have some free time, but not enough to work a reasonable number of shifts per week. If this describes you, then you have two options for getting a job. Option 1: work odd jobs that fit into your schedule. Option 2: make the time to get a part-time job. If you're still reading, then you must be very committed to getting a part time job. That's great! Let's take a look at how you can make the time to work. First, examine your calendar with an editing eye. How many of your activities are necessary? How many are even things you want to do? What things are you willing to give up? 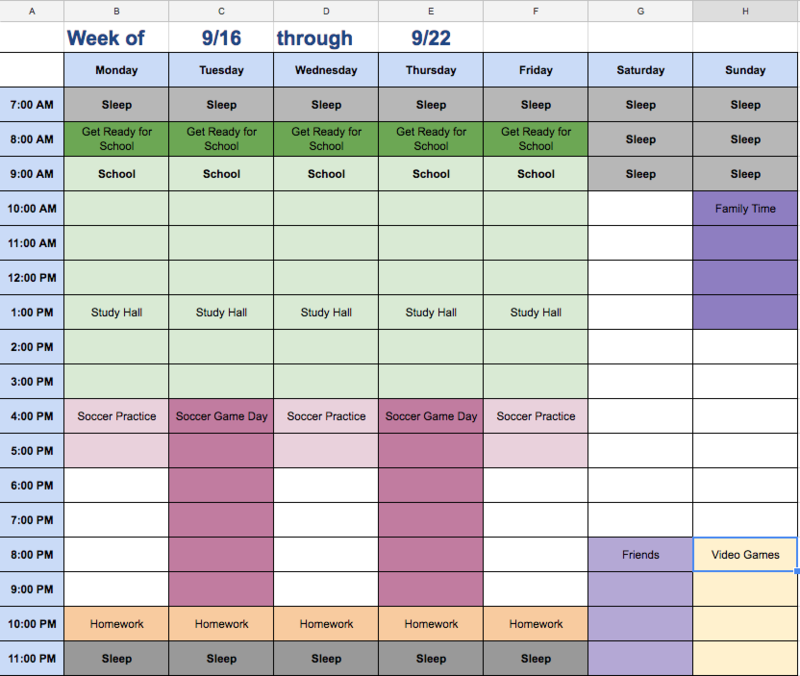 Are there ways to re-organize your schedule so you could fit in a reasonable work schedule? If there are any activities you can live without doing, cross them out. If you could cut back on any activities and participate fewer times per week, cross out some of those, too. If you could move any activities to different days or times to free up larger blocks of time, do that too. If reorganizing your schedule helped you find the time to work, then it's time to find a job that fits your schedule. Some job postings will say which shifts they are hoping to cover (nights, weekends, mornings, etc.). Others won't be as specific, but you may be able to make an educated guess based on when the business is open. For most jobs, assume they need to cover at least one weekend shift and at least a couple of days per week after school. When considering which jobs to apply for, use the schedule you created to make sure you are available. For example, if a job posting says they need a part-time worker to cover weekday mornings, you need not apply. You go to school on weekday mornings. If the job posting says they need someone to cover evening shifts, you may be available, and you should apply. For most job applications, you'll need to list your availability. Remember to include every day and time you could work. The more time you're available the more likely you are to get the job. Your employer is unlikely to schedule you to work during every free minute you've got. Once you begin working, you may begin to feel overwhelmed, even though the job fits into your schedule. Feeling overwhelmed by a new schedule is totally normal. For many people, that overwhelmed feeling passes once they establish a new routine. But if it's been a few weeks and balancing work and life still seems like too much to bear, it's time to make adjustments. Go back to your weekly planner. Determine if you can give up any of your activities or reorganize your schedule so you have more free time. If this solves the problem, great. If not, read on. If you can't adjust your life schedule so it's less overwhelming, adjust your work schedule. Most employers recognize that school needs to be your top priority. With that in mind, don't be afraid to ask for fewer shifts per week. If you've shown you have great work ethic and have built a good rapport with your boss, this shouldn't be a problem. Getting a part-time job for the school year is a great way for teens to make money and develop important skills. It's not right for everyone, but with a weekly planner and some basic time management skills, you can have a great work/life balance. Being employed through YES at Alternatives Federal Credit Union was a pivotal moment in my education and personal development. Having the chance to do something professional and serious allowed me to evaluate my goals and make informed choices regarding my future. YES took a chance on me and I am so glad they did. So much of what I learned about professionalism and being an adult was facilitated by my first job. I am currently living in Vienna, Austria and teaching English to high school students. The job is administered by the Fulbright Foundation and I spend lots of my time exploring and researching Austria and Central Europe. As a teen, my YES job was as a youth swim instructor at Cass Park. The majority of my job at Cass Park was to relate to the campers and give them guidance and direction. I often look back at this as an example of why I fight for the environment as I want to protect future generations ability to enjoy the outdoors as I did. ​I LOVE the YES program! This program provides you with the fundamental skills that you need for learning how to acquire a job, and it provides you with a guideline to learn how to become independent. I love this program primarily for teaching me that I can do what I love AND get paid to do it! My passion has always been dance and children. As a teen, my job through YES was at the Community Unity Music Education Program (CUMEP), which was a way for me to work with children in a musical way. Today I work at a community center as a program leader, I work at the Community School of Music & Arts as the Hip Hop dance instructor, I have my own performing dance group, and I'm teaching workshops performing and traveling! If it hadn't been for the YES program I wouldn't be as content as I am today! YES is phenomenal and I'm grateful for them. I first got started with the YES program during my senior year of high school. This period of my life was the most crucial time, and the decisions I made have affected my life, even as of today. I was extremely passionate about culinary arts and the YES program helped me find a career that was suitable. I worked at CTB through the YES program for a few months. CTB loved me so much that they hired me for a summer position before I left for college. During my time at CTB, I was able to learn about customer service and food safety. This was the best job I had in my youth, and to this day, working as a Line Chef at Mercato Bar & Kitchen, I see the customers that I had grown accustomed to seeing ever yday at CTB. I am now a graduate of Johnson & Wales University with my bachelors in food service management and culinary arts. I truly appreciate all that the YES program has done to help me. "I am so grateful to live in a city with so many opportunities for youth! Thank you for the excellent experience!" "Thank you guys so much for helping me this summer! I really respect how much time and effort you put into the teens of your program"
Youth Employment Service is a program of the Ithaca Youth Bureau, which is a department of the City of Ithaca. We receive support from the Tompkins County Youth Services Department, the Tompkins County Workforce Development Board, and the Joint Youth Commission.